Hybrid apps are "Write once, run anywhere". That means that the same app will run as a native app on iPhone, Android and Windows Phone and as a mobile web site on less popular platforms such as Blackberry. Also it’s usually easier to connect hybrid apps to corporate back office systems. So why aren't all apps hybrid? Because hybrid apps have to run on all devices, they can't take advantage of the particular features of each device. For example, iPhones don’t have infrared transmitters, so a universal remote control app might as well just be an Android native app. 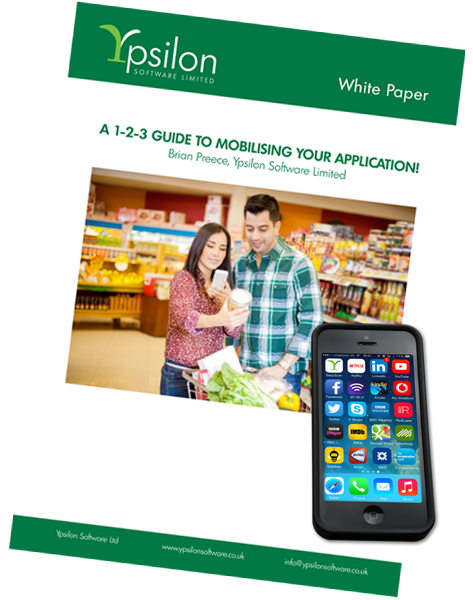 Click on the image on the right to request our white paper "1-2-3 Guide to Mobilising your Application" and read more about designing mobile apps. Then contact us at info@ypsilonsoftware.co.uk for a no-obligation free initial consultation with Ypsilon. For the full version of this article, request our white paper "1-2-3 Guide to Mobilising your Application". These days, everyone wants you to load their app - retailers, banks, airlines even taxi firms. Why? Because they want you to commit to them and not their competitors. Because they want to track your habits. Because they want you to see their logo every time you use your phone. Of course, it's not just about having an app. With so much competition for the space on your customers' phones, your app has got to be so useful and so compelling, they won't want to be without it. And it's not always the biggest companies that have the imagination or the flexibility to design a must-have app. Many of the apps you've heard of are so-called 'native' apps. They've been written especially for one type of device, be it iPhones, Android phones or Windows phones. But if you write a native app, it won't run on anything else. So if you want the widest possible reach, you have to write it all over again from scratch for iPhone, Android, Windows Phone. And then test it for each platform. And then update it for each platform. And what about Blackberry? Not many being sold now but lots of people have them. Is it worth writing a Blackberry app? Good question!